Life has been very busy lately. I just wanted to post this note that I wrote earlier today. I'm not sure when I will have time to post any new projects. It will likely be a week or so (at least). I trust the following note will be a blessing. If you have questions you would like to keep private, please mark your comment "Private" and leave your email address and I will be happy to get back to you. I will not publish any comments marked Private. Today I was able to witness something quite unique at church. The story actually began a while ago so I’d better go back a bit. For the last several years, my father-in-law has slowly developed kidney failure. His doctor was aware and was careful of the medications he prescribed in order to preserve kidney function as long as possible. In late 2009, while being hospitalized for another issue, it was determined that his disease had progressed to the point that it was time to consult with a kidney specialist (nephrologist). After much prayer, he began peritoneal dialysis in late August of 2011. One of the greatest advantages of peritoneal dialysis is that you are able to do your dialysis at home. Dad, mom, and I all went through specialized training to learn how to safely be able to do this. Our goal was not necessarily to prolong his life, but to improve his quality of life for the time he had left. Unfortunately, his body did not respond well to this type of dialysis and he was placed in the hospital on December 30. At that time, dad agreed to try hemodialysis and an access was placed on December 31. When dad decided to discontinue dialysis on Thursday, mom expressed that he really wanted to go to hear Daniel (my husband) teach Sunday School one more time. I assured her that we would get him there and that I would bring him home when it was over so that he wouldn’t need to sit through church. Someone had moved a rocking chair from the nursery into the auditorium so that he could be comfortable. Our pastor decided to start the morning service a few minutes early so that dad could say a few words before I took him home. Dad had really wanted to preach tonight, but we knew that was unlikely as he has been so weak. When I arrived to pick him up, he was so weak that it took some work to get him into the Jeep. (I’m pretty sure Philip won’t be concerned if I left tire tracks in his lawn when I drove my Jeep up to the front door.) We were late, but we made it. Dad sat comfortably in the rocker with his headphones and the speaker system and faded in and out of sleep throughout Sunday School. Many of our church family greeted him following Sunday School. Pastor had us start the service with a song. He asked dad if he wished to say anything but dad was fading in and out so much that he was not able to acknowledge him. Pastor said a few words about dad’s faithfulness. The teens then gathered around his chair and sang, “I Saw Jesus in You” by Ron Hamilton. Pastor came down, knelt beside dad’s chair and prayed for him. I can’t even tell you right now how many men came to help me get dad out to the car to take him home, but they gathered around and we assisted dad to his feet. At that point, he told us he wanted to stay. He had said little to anyone all morning so we were quite surprised. He then began to pray. “Thank you Father for the blessings you have given to me”. “Thank you Father for the blessings you have given my family”. He said the same words a few times and we sat him back in his chair where he remained the rest of the service. One of the newest members of our little church sat next to him throughout the whole service holding his hand. 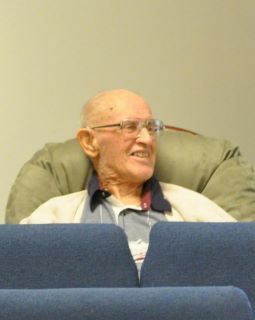 You may look at his many years as a Pastor and his 11 years in Australia and say, well of course he will be in heaven, he was such a GOOD man. If that’s what you’re thinking, you couldn’t be farther from the truth. Dad isn’t going to heaven because he was a good man. He’s not even going to heaven because he gave up so much to serve others. He’s not going because he was a Baptist or even because he was a pastor. Dad will be in heaven because he placed his faith and trust in Jesus alone to save him from his sins. He understood that he wasn’t good enough to stand before a perfect and holy God. He knew that no religion would get him there. It was Christ alone! How about you? Are you trusting in the fact that you’re “good enough” or that you have served others to get you to heaven? Are you trusting in your religious group? Do you think that you’re “Baptist enough”, “Catholic enough”, or “Mormon enough” to get to heaven. My dear friend, you can sit through every service in your church and still not know Jesus. Please don’t trust in YOU to get there. Trust in Jesus and His complete work on the cross. This photo was taken by my brother-in-law this morning during a rare alert moment. Oh! Praise God for VICTORY in the midst of the storm. Thank you for sharing this hope that we have. It's so wonderful that God loves in spite of ourselves. Thank you Jesus! I praise God that He is carrying your family through this situation. Hugs! Thank you so much for sharing. We had heard that he was not doing well. What a wonderful blessing for him to be able to share that time at church yesterday! Hazel and all of you are in our prayers. Pastor Elmo is so precious to us. We so wish that we could have been there for his last service. It brought tears to my eyes when you shared about the little one holding his hand. We enter this world so dependent and leave it just the same. What a good God we serve. Your father-in-law has always been such a sweet reflection of that. We love and miss you all. You are much in our prayers. Thank you for sharing, Cheri! I am so privileged to have known your father-in-law. What measureless comfort to know that he is now whole and with his Savior. The thought of the teens singing "I Saw Jesus in You" brought tears to my eyes, considering most of them are his grandchildren. What a wonderful heritage they have! Lord willing, we'll see you Tuesday.